Sometimes for important backup or other purposes, we need to print our contact info list into paper. Though iPhone is powerful and smart to use, it doesn’t support direct printing for contact list, not to mention if you want to print in bulk. It would be boring and annoying if you email your contacts each and print them one by one. Luckily, there are still ways to satisfy your need. 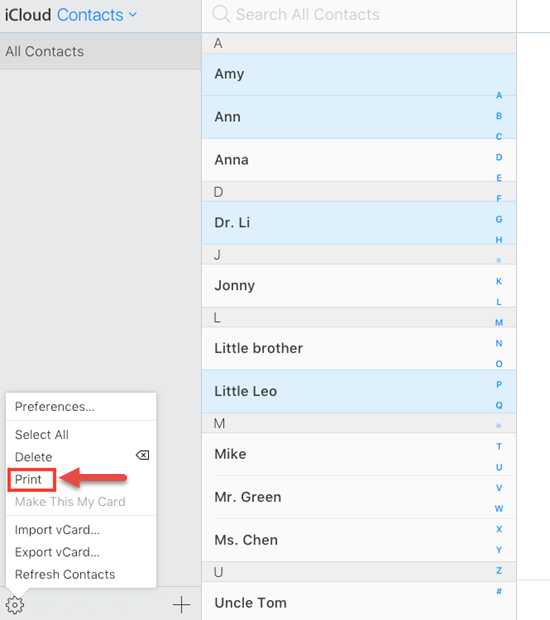 In this article, we will offer you 5 ways to easily print contacts from iPad, iPhone X, 8, 7, 6s and older models, supporting the latest iOS version. Apple iDevice doesn’t support direct printing for contacts, though it now has AirPrint. So to print out your contacts from iPhone/iPad, you need a authorized computer, and a powerful software. In this situation, Gihosoft iPhone Data Recovery gives you great help. 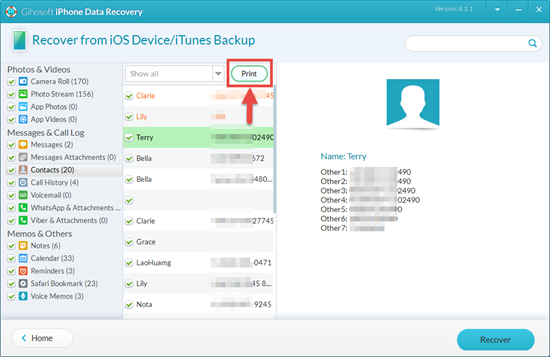 It’s not only a professional tool for lost data recovery on iOS devices, but also enables printing function for all data types it supports, including iPhone contacts. To print out your contacts, you just need to simply run the software with the steps below, and the software will finish the rest for you. Run the iPhone Contact Recovery on computer and select “Contacts” item. Connect iPhone to Computer, next starting scanning. View the result list page, then check/uncheck the contacts accordingly. Click the “Print” button on the top to print out contacts from iPhone/iPad. Not much people know, iTunes can actually help you sync contacts only to computer or other email services like Outlook, though it’s a little complicated. And hence you can also change this method into a good way to print your contacts from iPhone or iPad. iTunes syncing can’t be with iCloud syncing, so first you need to turn off iCloud contacts syncing in Settings > iCloud >Contacts if you’ve enabled it. Plug in your iPhone to computer and run iTunes. After iTunes recognizes your device, click on the iPhone icon on the top, and choose “Info” in the sidebar. Then open Start menu and go to your personal folder (username), click into Contacts folder, and multi-select your contacts. Click “Export” on the top bar and choose CSV. 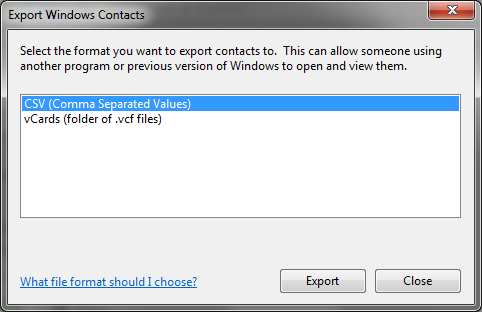 Then follow the instruction to export contacts as CSV file. Print the CSV file of your contacts from computer. Beside iTunes, iCloud also have print features enabled for contacts, and it’s much more easier to use than the iTunes one. To print contacts from iCloud, you just need to sign in iCloud website with your account, and follow these steps. Checked that you’ve activated Contacts syncing in Settings > iCloud. Sign in your Apple ID at iCloud.com, and click into Contacts icon. Click on the gear icon to “Select All” contacts. Again click on the gear icon and click on “Print”. Adjust your printer settings to print out contacts on iPhone. Note: If you’ve just activated the contacts syncing, then it will take time to complete the syncing process, so before you print them out, first check if all the contacts have already been synced to iCloud. If you receive iCloud error notification when you click on the Contacts icon and you are unable to get access to it, then you’d better follow other methods mentioned in this article to print out your iPhone contacts. 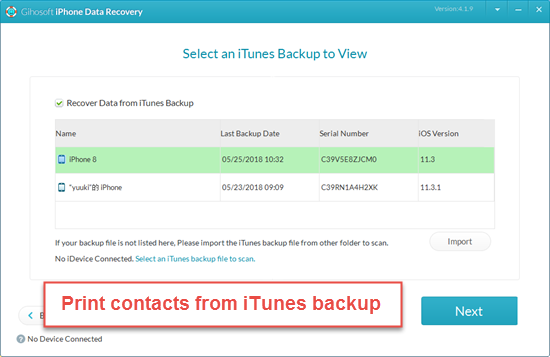 Moreover, you can choose to print contacts from iPhone/iPad backup, and this is extremely helpful if you currently don’t have your iPhone on hand or lost it. 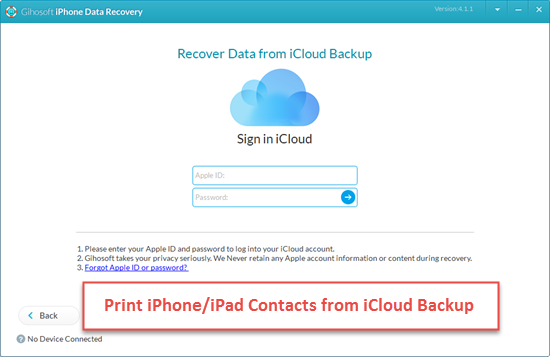 Gihosoft iPhone Data Recovery allows you to directly print contacts from either iTunes backup or iCloud backup, and all you need is the simple steps below. Step 1: Launch Gihosoft iPhone Data Recovery, and choose “Contacts”. Step 2: Don’t plug in iPhone. Choose “View iTunes Backup” and select the latest one. Step 3: After scanning, click on “Print” to print out your iPhone contacts. Step 1: Same as above. Step 2: Don’t plug in iPhone as well. Choose “View iCloud Backup” and sign in your Apple ID. Step 3: View the scanned result, and then click “Print” to start printing contacts from iPhone. Also, you can use other apps to sync your contacts first then print it out, like Google Contacts. This method is similar to the iCloud one, though a little more tedious. Let’s take Google Contacts as a example. First you need to install Google Contacts on your iPhone, and sign into your Google account to enable contact syncing. Then go to Google Contacts website and see if any missing. Select or check all contacts, then click on the three dot icon on the top. Click “Print” and adjust your printer settings, then print out your contacts. Note: If you want to keep your contacts print in order as a sheet, then you need to download them as a CSV file first, then print it out.